Former U.S. Rep. Beto O'Rourke, who gained a national following in his 2018 midterm race for Senate against Ted Cruz, has joined the crowded field of candidates vying to become the Democrats' 2020 presidential nominee. O'Rourke announced his long-awaited decision early Thursday morning before hitting the campaign trail in Iowa, driving himself around in a minivan between events with local voters. 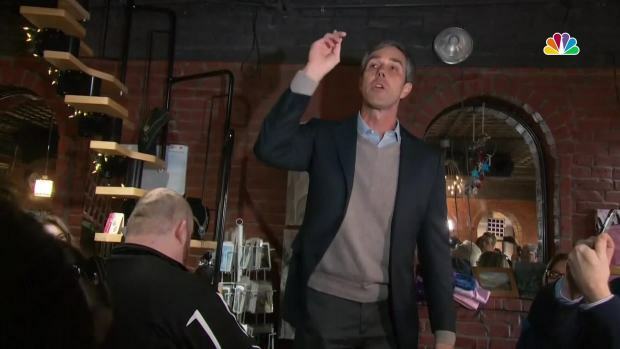 Former U.S. Rep. Beto O'Rourke hit the campaign trail with his first stop at a coffeeshop in Keokuk, Iowa, the morning he announced his bid for the Oval Office. "This is going to be a positive campaign that seeks to bring out the very best from every single one of us, that seeks to unite a very divided country," he said in a campaign video announcing his run. Before he left for Iowa, the three-term congressman from El Paso spoke with NBC 5 political reporter Julie Fine, telling her that he and his family had mulled their future together, and that of the country. "When we looked out at that, there is no sitting on the sidelines, there is no hoping that somebody else can get this done," O'Rourke said. The campaign will test whether the former congressman can replicate his insurgent run in Texas — he nearly upset Cruz — on the national stage, while facing off against a cast of Democrats that includes sitting senators, current and former governors and possibly a former vice president. At his first campaign stop, O'Rourke introduced himself to a crowd at a coffee shop in Keokuk, Iowa, saying he already missed his kids and that he hoped to speak with people of different political persuasions across Iowa and the country. "There's no sense in campaigning if you already know every single answer, if you're not willing to listen to those whom you wish to serve," O'Rourke said. The announcement that O'Rourke is running comes after months of speculation over what the Democrat was planning following his loss to Cruz by less than three percentage points in the 2018 Senate race. The 46-year-old came closer to unseating an incumbent Republican senator in the state than anyone since Democrat Bob Krueger narrowly lost to Republican John Tower in 1978, according to The Texas Tribune. O'Rourke outperformed Hillary Clinton in the Lonestar State's 10 largest counties, and even flipped Tarrant County, home to the city of Fort Worth and the largest county in Texas not to vote for a Democrat in a presidential election since 2008. He raised $80 million in the election, the most ever in a U.S. Senate race. Last month, after speculation had swirled that O'Rourke might make another run at a U.S. Senate seat, O'Rourke opted not to challenge incumbent Sen. John Cornyn, R-Texas, in 2020, two sources familiar with O'Rourke's thinking confirmed in February to NBC News. The Dallas Morning News was the first to report the decision. "Amy and I have made a decision about how we can best serve our country," O'Rourke said in a statement at the time. "We are excited to share it with everyone soon." O'Rourke set a self-imposed deadline about his future plans in a Feb. 5 interview with Oprah Winfrey, saying he would make a decision before the end of February, and that he had "been thinking about running for president." "With the eyes of the country upon us, all of us together are going to make our stand here in one of the safest cities in America," O'Rourke said. "Safe not because of walls, but in spite of walls." The day before his announcement, Vanity Fair released a long profile of O'Rourke in which he strongly hinted he'd be running: "Man, I’m just born to be in it." O'Rourke's star began to rise nationally in March 2017 when he and U.S. Rep. Will Hurd, a Republican from San Antonio, livestreamed a road trip from the Alamo City to Washington after a winter storm forced flight cancellations in the Northeast. The 2018 Senate race launched O'Rourke from a nearly anonymous member of the U.S. House of Representatives to a rising star in Democratic politics. O'Rourke started to make noise in the Senate race when his campaign released its fundraising numbers for the second quarter of 2018. The El Paso congressman raised $10.4 million in just three months, pulling him even with Cruz's six-year fundraising total in a span of 15 months. Part of O'Rourke's appeal was his reluctance to accept money from PACs. "Thirty-three dollars was the average; 215,714 unique contributions," O'Rourke said in August 2018. "All people, no PACs, mostly from Texas. That is a really good feeling." Many PACs, however, did send donors links to O'Rourke's campaign so they could donate directly to then-Senate candidate. One of his first viral moments came when he responded to a question at an event about whether he thought it was disrespectful for NFL players to take a knee during the national anthem. "My short answer is no. I don't think it's disrespectful," O'Rourke said in the clip. After he paid respect to veterans and thanked civil rights leaders who brought about change, O'Rourke said, "Non-violently, peacefully, while the eyes of this country are watching this game, they take a knee to bring our attention and our focus to this problem to ensure that we fix it. This is why they are doing it and I can think of nothing more American then to peacefully stand up or take a knee for your rights anywhere, any place, anytime." 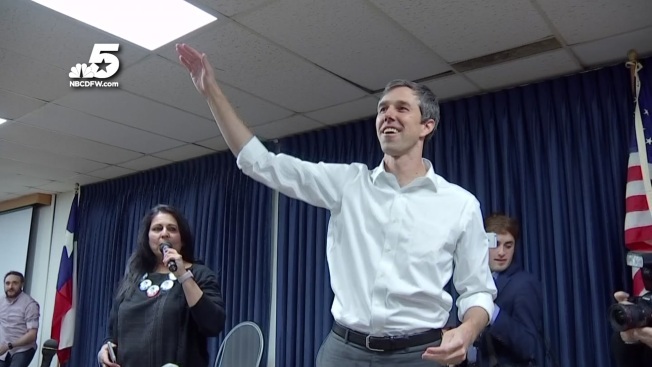 The clip drew attention from celebrities ranging from LeBron James to Ellen DeGeneres, who invited O'Rourke to appear on her show later in the campaign. During the race, O'Rourke's nickname -- "Beto" -- came under fire from the Cruz campaign. The former congressman's birth name is Robert Francis O'Rourke. "My parents have called me Beto from day one, and it's just -- it's kind of a nickname for Robert in El Paso. It just stuck," O'Rourke told CNN in 2018. Aside from going after him for his nickname, Texas Republicans tried to use the fact that O'Rourke was in a punk rock band called Foss when he was in his early 20s against him, in addition to more serious allegations. The official Twitter account of the Texas Republican party resurfaced a mugshot of O'Rourke from the 1990s. He was arrested twice for misdemeanors in his 20s, but was not convicted. The first time was in 1995 for a burglary charge, in which he jumped a fence at the University of Texas at El Paso. The second was in 1998, for a drunk driving arrest in El Paso. In August 2018, the Houston Chronicle found the police report from the 1998 incident, and discovered that a witness told police O'Rourke had tried to drive away from the scene after the crash. He ultimately completed a "court-approved diversion program" and the charge was dropped. Since his loss in the Senate race, O'Rourke has chosen an unorthodox path as he decided whether or not to run. On Jan. 10, he livestreamed a visit to the dentist; he wrote regularly on the website Medium about a solo roadtrip he took through parts of the country, stopping in states like Kansas, Colorado and New Mexico; and was interviewed by Winfrey in New York City. In his three terms in the House, O'Rourke's voting record was more conservative than most of his Democratic colleagues, according to Voteview.com, a site run by UCLA's Department of Political Science. In the 113th Congress (2013-15), O'Rourke was more conservative than 76 percent of House Democrats; in the 114th Congress (2015-17), he was more conservative than 79 percent of Democrats; and in the 115th Congress (2017-19), he was more conservative than 77 percent of House Democrats. In 2012, O'Rourke unseated eight-term incumbent Silvestre Reyes in the Democratic primary and won the general election to take Texas' 16th congressional district. Prior to serving in Congress, O'Rourke was on the El Paso City Council from 2005-11. The El Paso native is a graduate of Columbia University in New York. O'Rourke is the second candidate from Texas to enter the race, joining former San Antonio mayor and Housing and Urban Development Secretary in the Obama administration Julian Castro.